​A group of bred heifers were purchased from a producer in Nebraska in November 2015. The cows all calved well in the Spring of 2016. However, in November of 2016, only a 30% pregnancy rate in these cows was achieved. In addition, the body condition of cows was noted to be poor at that time. Bulls tested negative for Tritrichomonas foetus prior to release for breeding. An increased nutrition plan was instituted for the cows, but the pregnancy rate remained poor. CBC/serum chemistry panels on several of the cows revealed elevated liver enzymes, anemia, and eosinophilia. Animals were dewormed appropriately per referring DVM. The owner was deciding whether to sell this group of cows, but elected to sacrifice one for necropsy in an effort to determine any underlying cause of disease. The cow submitted for necropsy was in poor body condition. 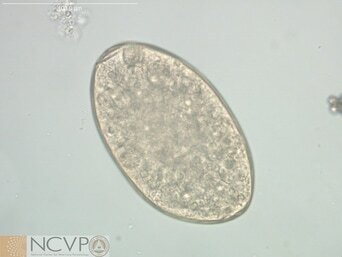 ​This organism is Fasciola hepatica, the common liver fluke, which infects sheep and cattle. In cattle, chronic infections are associated with the presence of adult trematodes in the bile ducts. Most fluke infections in adult cattle are sub-clinical, yet are of economic importance. Clinical fascioliasis may include signs such as gradual loss of condition, progressive weakness, anemia, and hypoproteinemia with development of edematous subcutaneous swellings. Studies assessing affect on fertility have provided variable results. ​This case is based on an actual necropsy case at the Oklahoma Animal Disease Diagnostic Laboratory, Stillwater, OK. Many thanks to pathologists Drs. Keith Bailey and Chia-Ching Chien for providing case details, and to Clinical Parasitologist Dr. Yoko Nagamori and Parasitology Technician Megan Wohltjen for image capture.